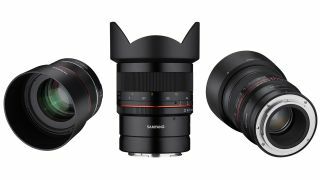 Samyang has unveiled three new lenses in its Spring Collection, this time a trio of Nikon optics. Mirroring the Canon EOS R optics already in the collection, the company has shown off a 14mm f/2.8 and an 85mm f/1.4 for the Nikon Z full-frame mirrorless mount, which could rank among the best Nikon lenses when they hit shelves. Also launched is an 85mm f/1.4 for the Nikon F DSLR lens mount. The three lenses will be sold, as usual, under the Rokinon name in North America. The Samyang AF 85mm F1.4 F is the manufacturer's second autofocus lens for the Nikon F mount (following last year's Samyang AF 14mm F2.8 F), offering DSLR shooters a superfast autofocus portrait prime. The nine-bladed aperture promises pleasing bokeh, and the lens design has already generated plenty of excitement in its Canon and Sony iterations. Owners of the Nikon Z6 or Nikon Z7 get a pair of lenses in the new collection, though both are manual focus-only, starting with the Samyang MF 14mm F2.8 Z that offers mirrorless shooters a relatively quick wide-angle prime. In addition to losing the autofocus of the DSLR version, the Samyang MF 85mm F1.4 Z has one fewer aperture blade – though the company assures us that its eight blades will still boast "circular aperture for 'smooth bokeh'". And, like its F-mount sibling, Samyang says that it produces faithful tones and edge-to-edge sharpness even when shooting wide open at f/1.4. All three lenses are 'Ultra-Multi-Coated', to deliver the best contrast and image quality across the frame, and they are also weather-sealed to make them practical in challenging shooting conditions. Pricing and availability have yet to be confirmed, though we know that the Canon RF version of the 14mm f/2.8 will cost £363 / $499, with the RF 85mm f/1.4 costing £320 / $399. The American pricing and availability for the Rokinon versions of these lenses has yet to be announced. If you happen to be in Beijing, you can get a closer look at the lenses at the China P&E 2019 show from 12-15 April.